With over 2,100 chord shapes, laid out in easy-to-read grids, together with chord note tables and formula listing, this is a handy resource for both learner and experienced guitarists. Tony intended the book as "...both as a reference for the more advanced guitarist, and as an educational tool for those beginning their journey into the wonderful, but at times, rather abstract world of chord playing. 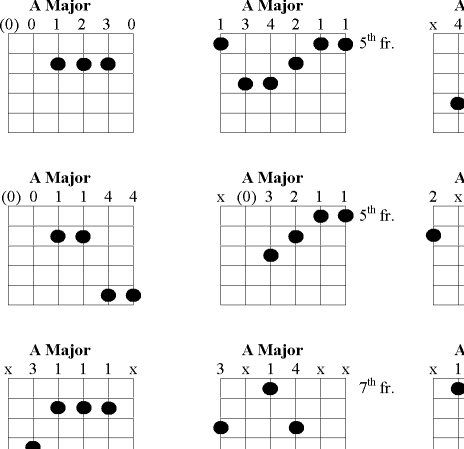 It contains not only many chord shapes, but a listing of the various formulae used to form chords. Whilst the real fun of music is in the playing, a serious study of the theoretical side of music will, for most people, make life easier: it certainly will be of great assistance if, like me, you decide at some stage of your career to engage in the sometimes rewarding, sometimes frustrating vocation, of teaching people how to play music. A sound theoretical knowledge of music facilitates the communication of ideas from teacher to student." It's in PDF format, so you can use it on your PC or Mac, or print it out. At 168 pages, use double-sided (duplex) printing if possible. if you're unhappy with your purchase, contact us and we'll issue a full refund.